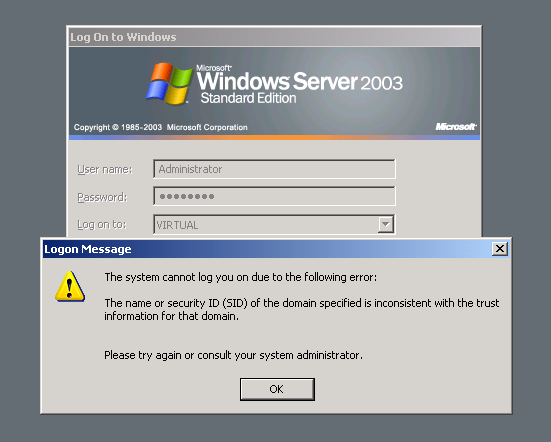 The name or security ID (SID) of the domain specified is inconsistent with the trust information for that domain." "The system cannot log you on due to the following error: The name or security ID (SID) of the domain specified is inconsistent with the trust information for that domain." 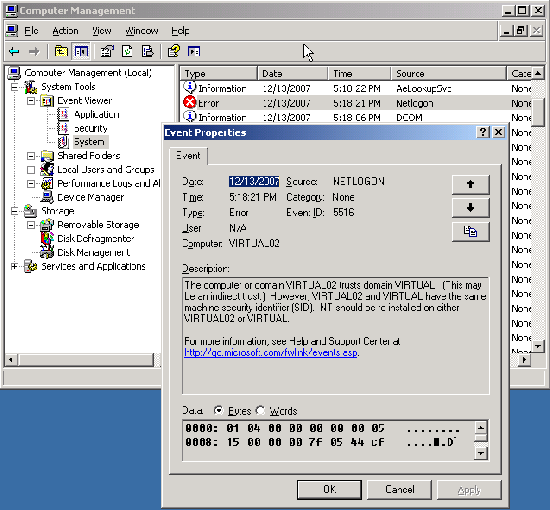 Note: The problem will not occured if you use System Preparation Tool (Sysprep.exe) or some system duplication tools such as Symantec’s Ghost, Altiris’s RapiDeploy, etc. These tools will change a computer’s SID after a system has been cloned automatically. You can solve the problem by run newsid program on the duplicated system. 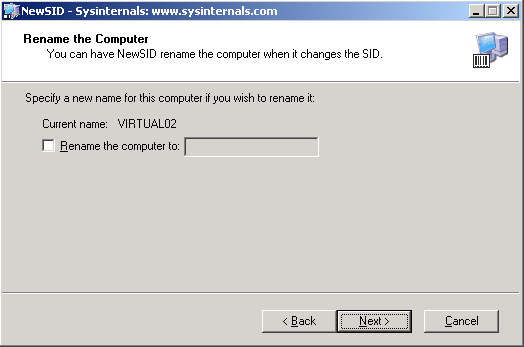 The program will generates new sid for the sytem so that it’s no longer duplicate with the original one. 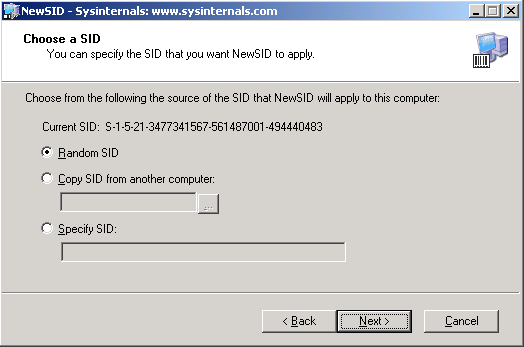 If you have already join the domain, disjoined the domain before apply newsid program in the next step. Note: If you apply the program without disjoined the domain, permissions of all users on the domain won’t be set on the computer. For example, if you have applied newsid program without disjoined the domain and you try to use domain admin account to login to the computer. The account won’t have permission as an administrator but only as a user. 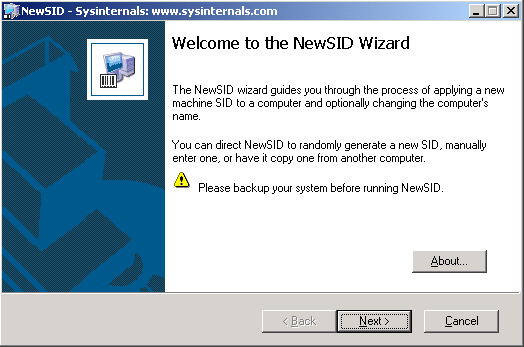 Download NewSID v4.10 from sysinternal.com or at here. Select Random SID. Click Next. You can also rename the computer name if you want. 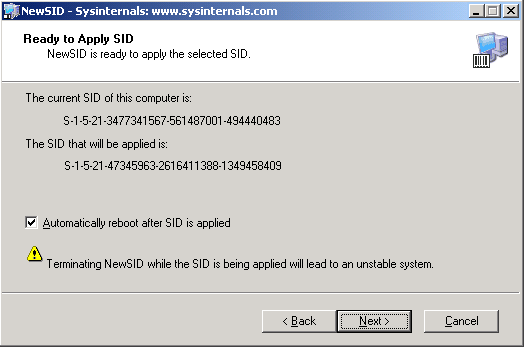 Click Next and wait a few minutes for applying new sid. Then the system will automatically restarts. Now join the domain again and now you can use the system without the error as stated at the beginning.